Progeno is a Ghent University spin-off company that aims to empower professional plant and animal breeders by giving them direct access to the state-of-the-art in breeding and selection methods by means of a user-friendly and industry-proven software system. Progeno software warrants a more cost-effective breeding programme as well as a faster genetic progress. The Progeno software framework consists of three main components: a central database, the computing engine and a web-based front-end. 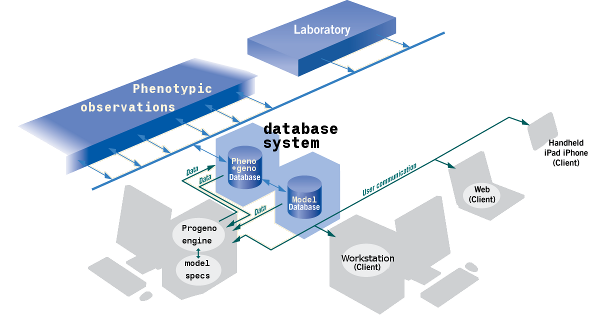 The database stores pedigree information, (statistically corrected) phenotypic observations and molecular marker scores if available. These generally large and unbalanced data sets are fed to the computing engine which produces prediction models and breeding values for all traits of interest. Breeders can query the system by means of a user friendly web application that is running in their web browser so no client-side software installation is required. The software framework is generally hosted on a dedicated server residing within the walls of the breeding company and only made accessible to breeders that have the appropriate privileges. Despite the use of highly advanced mathematical and computational techniques, the Progeno system is straightforward to use by practical breeders, giving direct access to trial results, breeding values, cross predictions and multi-trait breeding advice. Breeders of hybrid varieties can also retrieve general and specific combining abilities for inbred lines and hybrids respectively. Depending on the availability of molecular marker information, cross predictions and breeding advice can be generated from pedigree-based models, genomic prediction models or both. The Progeno engine corrects the available phenotypic observations for unexplained variation or spatial trends and an outlier detection routine identifies erroneous measurements and data anomalies. The Progeno computing engine is the central core of the software framework. It is a newly developed linear mixed model solver that provides ample model flexibility to fit optimal linear mixed models to large amounts of phenotypic and genotypic data originating from all sorts of breeding schemes. Unknown variance parameters can be estimated by means of the Average Information Restricted Maximum Likelihood (AI-REML) algorithm. The computational workload can be distributed over all available processing units (CPU cores) which allows to fit very elaborate linear mixed model formulations. The software can be configured to autonomously determine the linear mixed model formulation that fits best to your data. In case of multi-environment trials, the system fits a set of candidate linear mixed models to the data of each trial separately and then combines all individually optimized trial models in a meta model which is used to analyze all data from all trials in a single run. In this meta-analysis, the linear mixed model formulation is fine-tuned by an iterative procedure of REML optimization of variance parameter estimates and outlier detection and removal. The resulting meta model is used to calculate Best Linear Unbiased Predictors (BLUPs) of all breeding values or combining abilities. The computing engine has been specifically optimized to fit mixed model-based genomic prediction models such as ridge regression (GBLUP) and Reproducing Kernel Hilbert Space (RKHS) regression. Fitting a ridge regression model on data containing genotype scores from 100k SNP arrays on thousands of individuals takes but a few minutes (including REML-based penalization parameter determination).